Jazz up a plain mirror with an artistic array of plaster blossoms. 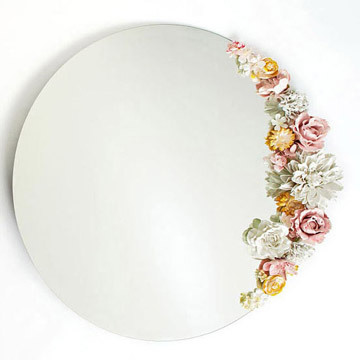 I once spotted a framed mirror embellished with paper flowers on the virtual bulletin board Pinterest (pinterest.com). A charming idea, but the project had one drawback—it seemed way too delicate for any practical purpose. That&apos;s when the lightbulb went on. Why not make plaster flowers like the ones I&apos;d seen on vintage frames and stick them onto a beveled mirror? The end result is romantic yet modern. Step 1: Clip stems of fake flowers to 3 or 4 inches in length and remove any leaves. Step 2: Make one small batch at a time of plaster of paris in a plastic bowl. Mix plaster—start with 2 cups to 1 cup water. Add more water or plaster as needed to achieve the consistency of pancake batter. Stir until smooth. 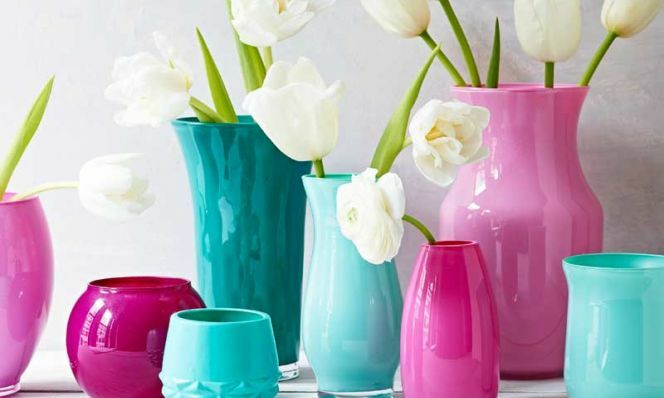 If you want a hue other than white, add a few drops of food coloring. Step 3: Hold a flower by its stem and place it facedown in plaster and swirl to cover. Gently shake off excess and hang upside down with clothespin on a wire hanger. For tiny flowers, stick stems into a Styrofoam block. Let dry. Repeat process until all flowers are coated. Step 4: When plaster becomes too stiff to work with, toss and mix up a fresh batch. Some flowers look better with a single coat of plaster, others benefit from a second dip. Step 5: When all flowers are thoroughly dry, cut off stems completely, then spray with two to three light coats of matte fixative for a more durable finish. Step 6: Arrange the flowers on a beveled mirror as desired, and glue onto surface using a heavy-duty adhesive. Remove hardened plaster by flexing the bowls to break plaster into pieces, and discard in the trash. Food coloring, like the McCormick set in Neon, produces the most consistent colors.